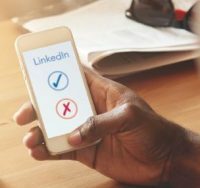 With over 500 million users in more than 200 countries (including at least a million lawyers) and web traffic that ranks it as the 18th most visited site on the planet, LinkedIn is the social networking tool of choice for professionals. LinkedIn (LI) can also be useful to law students in a number of ways. First, it can help with your job search. A LI network can be helpful for finding people you (or your contacts) know at law firms you are interested in. Second, it gives you some on­line profile. Potential employers are likely to “Google” you and look at what you have posted in social media circles. They will also look to see your online connections and friends. If you aren’t on LI, you should take the plunge. It is very easy to create and maintain a presence on LI. And, when one considers ethical obligations and other practical dangers, LI is the safest social media tool for lawyers to use. 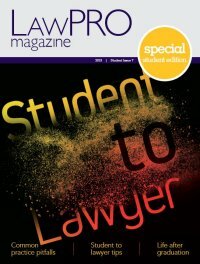 In this article I share my thoughts on the basic do’s and don’ts of how a law student can create and build a presence on LI. Don’t list every job you ever had: Some of you were lucky enough to have really interesting, exciting or unusual summer jobs. Good for you, but will it really impress the firm where you want a job (or a potential client when you are a lawyer)? In many cases, probably not. Include a reasonable level of detail about your pre-law school work experience if you think it will impress a potential employer. Do list other relevant or interesting background: You should include other relevant background information in your profile. The LI profile page outlines what you should include. Give details about your college or university degrees; affiliations, articles or books you have written; awards you have won; volunteer experience and so on. Note that you can change the order of the sections on the profiles page – put the sections that highlight your strengths at the top of your profile. Don’t use formal and dry CV-speak: Inject a little personality to let people know more about you. Ask yourself what prospective employers really want to learn about you. Do be careful about conflicts of interest: You may need to be cautious about connecting with the judges, experts or opposing counsel that might be involved with matters a potential employer is handling. Having such people as contacts could help you get a job, but they could also create a conflict of interest for a firm that wants to hire you. Do use the “My Network” feature: Look for My Network on the top bar, and click on it to see contacts “Recommended for you.” It generates this list by using keywords and by looking at the contacts of your contacts. It does a good job of finding people that you will know. Do be professional: What goes around comes around, and it doesn’t matter if it’s in person, in print or online. Be professional at all times, because everyone is connected to everyone on the web. When using LI you must comply with the Rules of Professional Conduct at all times. Don’t use LI messages for lawyer/client communications (a tip for when you are working): You can’t assume messages sent through LI are private. Don’t use it for lawyer/client communications. Do comment on the updates your contacts post: If you like, agree, or even disagree with something one of your contacts has posted, share your two cents by posting a comment on the original post. For reputation building, try to post comments on the updates of respected or well-connected contacts. Do ask questions: Social media is all about two-way communication and interactions. Asking a question in an update is a great way to engage your contacts in a discussion. And if you ask a question, make sure you read and comment on the answers! Do join a LI group: LI has a groups feature. Groups help people that are interested in a particular topic, entity or event find each other. There are also groups for events, associations and other entities. I guarantee there are groups on many topics relevant to your area of practice. Click on “My Network > Recommended for you > Groups” and enter some keywords to search for groups that are of interest to you. But be warned: Some groups have far too many consultants and vendors aggressively marketing themselves. Dan Pinnington is President & CEO of LawPRO.